I'm like a kid in a candy store with these Ice Cream of the Month Club ice creams sitting in my freezer. I feel a little silly, but I actually cracked open the Eggnog flavor last night and took a big whiff. There is no part of my brain that is tuned into the eggnog frequency, but man does this stuff smell good. I had it on the brain all day and I couldn't help but do a taste test when we got home today. I happily opened the container, scooped out a serving and dug in...and that's when I remembered I don't like egg nog. Sorry, I just don't. It reminds me of gingerbread men or other seasonal treats that I've just never been that in to. 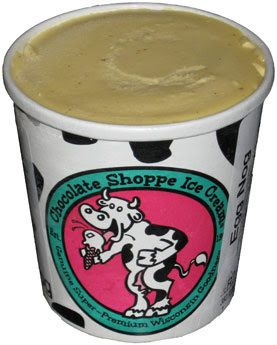 Chocolate shoppe says they are the best ice cream in Wisconsin, and I'll agree it's a quality product, but I can only say so much when I'm just not into the flavor. I got about half way through before I started dipping some pretzels in to the bowl to break up that gingery/nutmeg/whatever it is vibe. ....sorry, still staring at this gigantic flavor list. Man they have some awesome looking stuff!